alaTest ha raccolto ed analizzato 16 recensioni su ZTE Blade V. La media della valutazione per questo prodotto è 3.8/5, confrontata con la media della valutazione di 4.1/5 per altri Cellulari. I commenti su fotocamera e performance sono globale positive. In aggiunta, portabilità e usabilità ottengono ottime recensioni. Si possono individuare recensioni non positive circa il design. Abbiamo analizzato differenti valutazioni di esperti ed utenti, età del prodotto ed altri elementi. A confronto con altri Cellulari, ZTE Blade V ha ottenuto un alaScore™ complessivo di 86/100 = qualità Molto buono. Chunky ; Does it solve any problems? Its cheap, but is it cheerful? If you haven't got much money to spend on a smartphone then the Blade V might be just what you're looking for. It cost just £72 on a Pay As You Go basis from Virgin Media –that's cheap especially for what's on offer here. With its extremely low price, the ZTE Blade V is a good budget smartphone. It has a respectable screen and design but falls down on cameras and software. If you can afford the extra for a Motorola Moto G you'll get a much better all-round experience. Like the recently reviewed Moto G, the ZTE Blade V considers itself to be a smartphone for those on a limited budget. The budget end of the smartphone world is always a tad scary. 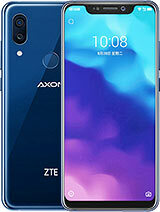 This, the ZTE Blade V, has a 5 megapixel camera with flash, 4GB of internal memory, a microSD card slot and a quad-core 1.2GHz CPU. For a double-digit price-tag, some sensible trimmings have been made to ensure that this is a speedy and well-designed handset.